A very relevant and useful concept to relate to is the concept of Environmental Performance Evaluation (EPE) as it is used and defined in the ISO work on standardisation inside the field of Environmental Management1. 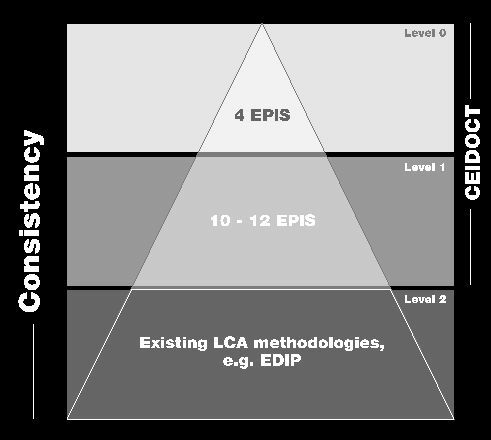 Here EPE is defined as: "A process to select environmental indicators and to measure, analyse, assess, report and communicate an organisation's environmental performance against its environmental performance criteria": This task will generally be accomplished by the use of a set of Environmental Performance Indicators (EPIs) agreed upon as a useful way to measure Environmental Performance (EP) for the company in question. In the ISO draft standard environmental indicators are defined as: "A specific expression that provides information about an organisation's environmental performance2 efforts to influence that performance, or the condition of the environment3." This demand does not imply a full LCA of a new technology, but a D -LCA related to the reference technology; D -LCA implying that only environmentally different elements of the two technologies are considered. The reference technologies should therefore be described and documented in a full life cycle perspective covering all life cycle stages to facilitate the use of D -LCAs. For references, please go to https://www.eea.europa.eu/publications/TEC01/2.html or scan the QR code.